I read my first Angela Carter book last year – ‘The Bloody Chamber’. I enjoyed Carter’s unconventional take on popular fairytales (the retelling of fairytales seems to be the rage today, but when Carter did that, she was probably a pioneer) and so was hoping to read one of her novels sometime. 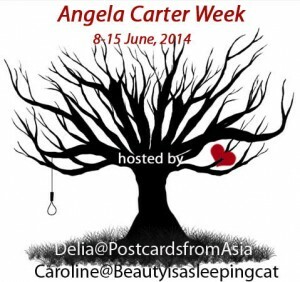 So, when Caroline from ‘Beauty is a Sleeping Cat’ and Delia from ‘Postcards from Asia’ announced that they were going to host Angela Carter week, I was quite thrilled (You can find more about it, here and here.). It was time to read my second Carter book. While deciding on which book to pick, I thought of three of her novels – ‘The Magic Toyshop’, ‘Nights at the Circus’ and ‘Love’. 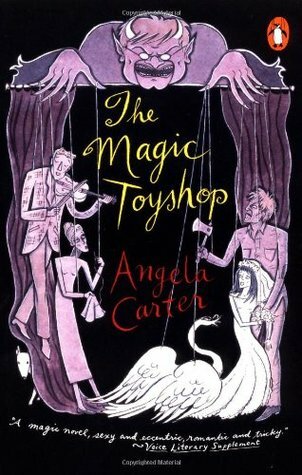 I opted to read ‘The Magic Toyshop’ because it was one of her earlier books and also the plot looked quite straightforward (I can hear you saying – “Yeah, keep thinking that. Angela Carter and straightforward simplicity – that is a total illusion. Carter’s books are always layered and complex and reveal themselves more on multiple readings.” Well, I can see that now 🙂 ) I finished reading ‘The Magic Toyshop’ yesterday. Here is what I think. ‘The Magic Toyshop’ is about a fifteen year old girl, Melanie. In the first scene of the story, Melanie discovers one day that she is a woman. She explores her body and her sexuality and she takes her mother’s wedding dress and puts it on while doing that. Unfortunately, after a while, when she is walking around in the garden, she discovers that she is locked out of her house wearing her mother’s wedding dress. She is too embarrassed to ring the bell and ask the housekeeper to open the door. She climbs the tree next to her window and gets into her room. In the process her mother’s wedding dress gets destroyed. When she gets up the next morning, she receives a telegram. Without even reading the contents, she knows what is in it – that her parents are dead. Melanie’s parents are away in America where her father is on a lecture tour, while she and her brother and sister are being taken care of by the housekeeper. The telegram says that her parents have died in a plane crash. Now their situation becomes difficult – the house is sold, the housekeeper finds a new job and they are sent away to live with their uncle and his family, an uncle who was always avoided by her parents. Melanie finds her uncle’s house quite old-fashioned with fewer facilities. Her aunt is dumb – she has lost her speech after she got married – and her aunt’s two younger brothers also live with her. The elder of the two is a musician and plays the violin. The younger of the two helps out her uncle in his work. Melanie’s uncle makes toys of all kinds and is very good at it. We can even say that he is an artist who loves his art. He also holds a puppet show in his studio a couple of times a year and only the family is invited to watch it. But Melanie’s uncle has a dark side – he is mean and is a bully and doesn’t care much about his family. He refuses to speak to Melanie and her siblings for a long time. In contrast, Melanie’s aunt is a very kind person and soon Melanie grows to love her. Melanie also grows to like her aunt’s brothers and the younger of the two, Finn, is attracted towards her. Melanie is uncomfortable with it in the beginning, but gets used to it after a while. The rest of the book charts the relationships between these characters, the beautiful moments they have (one of my favourite scenes in the book is the one in which Melanie spies her aunt playing the flute, her aunt’s brother Francie playing the violin and Finn dancing to the tune. The scene ends with the sentence – “And this was how the red people passed their time and amused themselves when they thought nobody was watching.”), the pall of gloom that hangs around the house when the uncle is around and the free spirit which reigns when he is not, and the surprises which get revealed at unlikely times. ‘The Magic Toyshop’ is first and foremost a coming of age story of Melanie when she first discovers herself and grows up to become a young woman. 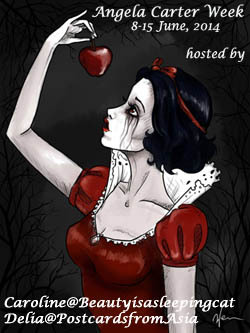 Within this framework, Carter has also woven her own versions of fairytales. There are frequent references to Bluebeard which makes one think that the book might be Carter’s own long take on the original Bluebeard story with Melanie’s uncle being the potential Bluebeard here. There are also lots of literary and cultural references in the story which I liked very much. Some of my favourites were the references to Ronald Coleman (if you like old classic black-and-white movies you have probably seen ‘Random Harvest’ or ‘Lost Horizon’, both starring Ronald Coleman – both are wonderful), the Doric column (“She was wearing her straight grey dress and looked like a Doric column” – it made me think of the days when I read my first book on art and discovered Ionic, Doric and Corinthian columns and how the Doric was the plainest of the three and so seeing Carter talking about Doric columns made me nostalgic), Coleridge’s poem on the Ancient Mariner and the Biggles books. Angela Carter’s prose is beautiful. She doesn’t write long passages and pages filled with beauty but sprinkles beautiful sentences across the book. Some of my favourite sentences were these. Photographs are chunks of time you can hold in your hand. His Atlantic-coloured regard went over Melanie like a wave; she submerged in it. She would have been soaked if it had been water. The curl of his wrist was a chord of music, perfect, resolved. The moment was eternity, trembling like a dewdrop on a rose, endlessly about to fall. She splashed the shreds of the absurd night out of her eyes with cold water. The tune was finished. It did not so much reach a conclusion as slow down and dribble into silence, as though the players had got bored with the melody and let it slip through their fingers carelessly. I enjoyed reading my first Angela Carter novel. I hope to read ‘Nights at the Circus’ and ‘Love’ someday. I will leave you with links to other reviews of the book. Have you read ‘The Magic Toyshop’? What do you think about it?